Since 1959 Bernd and Hilla Becher have been photographing industrial structures that exemplify modernist engineering, such as gas reservoirs and water towers. Their photographs are often presented in groups of similar design; their repeated images make these everyday buildings seem strangely imposing and alien. 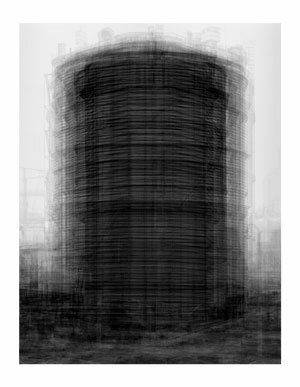 Idris Khan’s Every... Bernd And Hilla Becher... series appropriates the Bechers’ imagery and compiles their collections into single super-images. 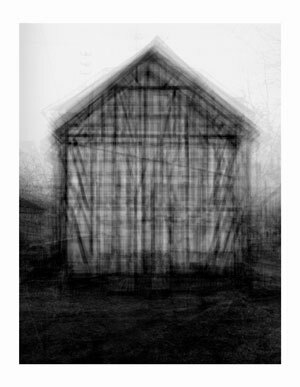 In this piece, multiple images of American-style gabled houses are digitally layered and super-imposed giving the effect of an impressionistic drawing or blurred film still. The structures in the Bechers’ original photographs are almost identical, though in Khan’s hands the images’ contrast and opacity is adjusted to ensure each layer can be seen and has presence. 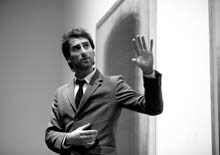 Though Khan works in mechanised media and his images are of industrial subjects, their effect is of a soft ethereal energy. They exude a transfixing spiritual quality in their densely compacted details and ghostly outlines. ...Prison Type Gasholders conveys a sense of time depicted in motion, as if transporting the old building, in its obsolete black and white format, into the extreme future. The Bechers took their photos as a means to document a disappearing tradition; by grouping them according to ‘typology’ the buildings’ designs function like archetypal symbols or an architectural language. 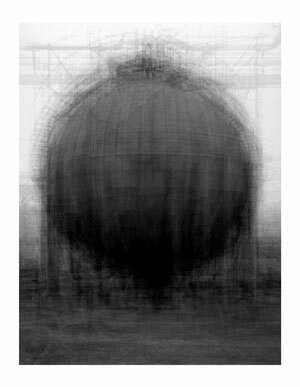 Through Khan’s translucent aggregations, structures such as ...Spherical Type Gasholders lose their commanding simplicity and rigid formalism and descend into fractured and gestural blurs. Through his photographs Khan compresses the timeline of repetition into indivisible subsuming moments and creates a poetic mutability from the fixed codes of history.